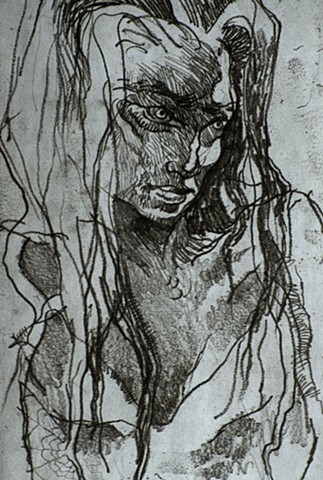 From 1982 to 1985, I was fortunate to study printmaking at the University of South Florida. I loved the processes of etching and lithography, and the school had/has an excellent print collection. I worked in the printmaking department, taking care of their slide library. And sold my first accomplished etchings to a graduate student and his girlfriend. It wasn't until 1989 or so, that I again had access to a printmaking studio. This I found, at Laney College in Oakland. "She" was made at that time.